Here is another update to RBRvr which should fix the latency issues with rendering introduced in v1.4. It took a long time to find a way to get it working properly, but now it should be a lot more pleasant to look at. 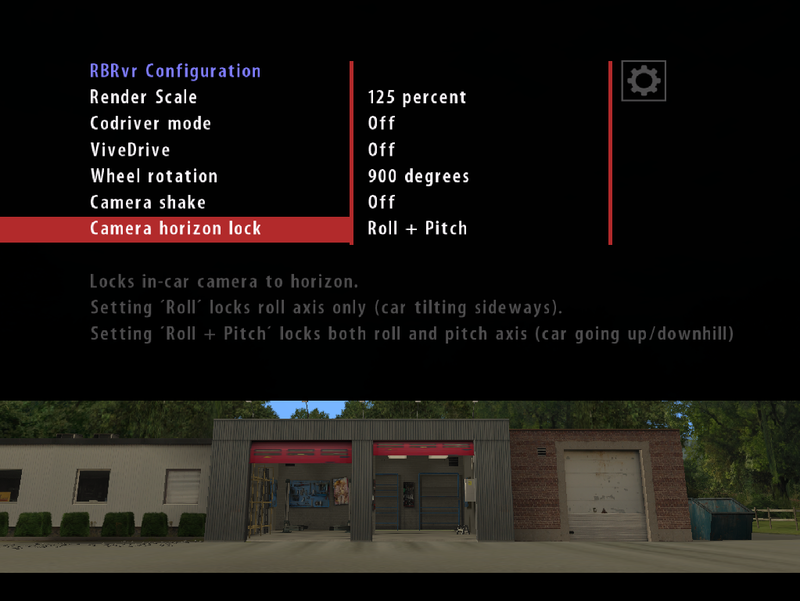 In addition it comes with options to disable the default camera shake in the in-car view and and to lock the camera to the horizon in either roll axis only or roll + pitch. I did not have time to test it thoroughly so its possible there are some bugs as the RBR camera override is now done in a totally different manner. Download from here (v1.5). See the readme.txt for instructions and some troubleshooting hints. In-game you can also find a quick help sheet from the desk. this is a great achievement, thanks a lot! Still, compared to v1.2 for the dk2, its quite more demanding – I run v1.2 with 250% render scale without any frame drops compared to v.14/1.5 which has a lot of frame drops already at 200% in some stages. Also, the behavior of the frame drops seem to be different in each version, v1.4 and v1.5: when it drops in 1.5 it feels it goes instantly to half the frame rate while with 1.4 it just drops 15 or 20 frames. Is it using a different way to adapt to bad framerate? last question: whats the default value of rbr regarding camera shake, on or off? I want to have it like it is in v.1.2/1.3/1.4. Pedro, I think you’re Portuguese, right? I’m on RBRCZ for a couple of years and just recently get into VR with Oculus Rift and a GTX960. I believe you can give me some tips, can you send me an email? Works very well for me (render scale 1.5). Thanks Kegetys! Thank you kegetys, Dirt Rally bored me pretty quickly, even in VR, so now I’m back to my good old RBR ! Works awesome thanks for the mod. One question, can I remap the keys for cockpit position? My keyboard does not have t num pad. No you cannot, but you can use the Vive controller to adjust the seat as well (I guess it should work with Touch too but I don’t know the button mappings). thanks keygetys! great addon for RBR. just on question: to have a better picture quality I have an option in your plugin for render scale, but i can modify the pixel density in steam vr as well. do this two things the same, shoud i use both, or just one, what is your recommendation? thanks in advance. Just like in other games the two settings add up so if you increase both you will just get a lot more supersampling. Whichever setting you use is really up to what you find easier to use I suppose, though note that SteamVR recently changed the meaning of the supersampling value to mean a multiplier for the total number of pixels, while the RBRvr setting is a multiplier for both width and height. thx, understood. and once again, great tool! Hi, I have runtime error when stage loaded, the problem is at all stage. Any sugestion ? Returning to RBR thanks to your VR plugin! I have but one issue: The framerate does seem to be lower than 90fps (maybe 60fps?). Maybe it is that the game only updates at 60fps while the actual rift fps is 90fps. I have disabled vsync everywhere but that does not seem to have an effect. Using a geforce 1070 with an oculus rift. Maybe I am missing something. Do you have a solution? Ok nevermind I made it work somehow. The Oculus driver switched off the Unknown Source execution for some reason and Steam had to be off for the game to show up. Now all is good. The game menu being in the VR is a great idea. Thank you for this superb plugin! how did you managed to keep steam vr from opening? My name is José Ángel, from Spain (Tenerife), user of DiRT Rally and since half a year ago, user of RBR. I recently adquired an Oculus Rift and tried RBRvr plugin but… it doesn’t work. - Installed in RBR with NGP plugin and in RBR vanilla (clean), last version. - Installed last SteamVR (from august) and last beta SteamVR (from september). Could you help me? Thanks a lot. My computer: i5 4670k, GTX770, 32 Gb RAM, Windows 7 64-bit (updated). Installed Ms Visual C++ 2005, 2008, 2010, 2012, 2013 and 2015. All Oculus apps run perfectly and almost all steamvr apps too. That seems strange, but unfortunately I can’t really think of reasons what could be causing it. You could try running Sysinternals Debugview and then running RBR which will capture and display some debug output, but I doubt it will show much useful info considering the crash. In fact, it works 1 of 3 times, more or less. And sometimes, when it works, fails loading the track. Thanks and Big work, Kegetys!! Tested again in a fresh Windows 7, fresh RBR, with only Checz, ZFix and NGP plugin added and now…. it works! Only happens sometimes when closing RBR it doesn’t return to SteamVR correctly and I can’t run RBR again (kegetys screen showed) and I have to close SteamVR and restart oculus service or, sometimes, restart Windows 7. For some time i have noticed that since this new steamVR versions (1.3/1.4/1.5), the colors have less contrast than in the dk2 version (1.2). After testing rfactor 2 (that also uses steamVR only) where the colors also lack contrast and punch (mainly a black level problem), I realize it is something to do with how steamVR translates the image to the oculus rift cv1 (which is my headset). I imagine it looks better in the Vive, but could you include again the gamma adjustment in the cfg file of your mod like you had in the version 1.2 for the dk2? It would be really useful for us cv1 users to have a better picture. Maybe it is just a couple of lines I can put in rbrvr.cfg? Adjusting the gamma isn’t quite so easy as the headsets aren’t visible as normal displays anymore. It would require adding some postprocessing layer to RBRvr, not sure if if I can find time to do that but I’ll note it for the future. thanks for the answer and thinking about it. I think it would be great if you could do it, mostly because it seems more people use the rift for simracing even though rbrvr is primarily using steamVR which I think is more optimized for the Vive. Cheers, keep up the good work, congrats. I would like to thank you personally for your hard work, but I would also like to report that my game keeps crashing (as in bsod) every once in a while when I launch it with my HTC Vive headset and also when starting my 2nd or 3rd race without leaving the rbr season. I would be happy to provide you with crash dumps, logs, dxdiag, msinfo32, etc. if you’re still working on RBRvr. If you get a blue screen of death it is always a hardware or driver fault (user level software like RBRvr cannot directly cause a BSOD even if they wanted to). However something RBRvr does could trigger it, but its basically impossible for me to debug… Best bet would be to upgrade drivers, check for overheating and such things. I will look into my software situation and try to sort it out. It’s probably just an issue with AMDs +17.7 drivers where something seems to have changed how the package them, but since I’m already here (and I hope you don’t take this the wrong way) but would it be possible for you to consider having a look at the unofficial HTC Vive support for DiRT Rally which seems to have magically broke after the last patch? You’re probably already aware of the Revive Project https://github.com/LibreVR/Revive/releases but after Codemasters v1.22 update for DR something broke and no one seems to be able to activate it (or maybe we’re all doing it wrong, but I don’t think that’s the case) where as before it was just a matter of dropping your game .exe on the program and it would automatically launch through SteamVR and working flawlessly. I know you’re a busy man and can’t help to fix the whole worlds problems, but I would kindly ask of you to consider my request, feel free to contact me if you need a guinea pig. Unfortunately I do not have Dirt Rally and don’t really know how Revive works so I am not the best person to look into that (in addition I am away from my VR gear for about a month right now). Hi there! Love your work! I’ve used this mod A LOT! It works flawlessly! Also the co-driving option is great! We have always dreamed of going competing together so now I can drive her around which is awesome. When I saw the Codriving mode I instantly thought of the idea of why not let the co-driver have a piece of paper infront of them aswell? I mean you got the htc vive controlls to work ingame? Could it work to have a peice of paper infront of you and you hold it with 1 controller and you can turn paper with the other, it would make for an really awesome co-op experience and also it’s good practice for whenever we go rally together. For the notes best thing would be to convert the already existing notes onto the paper but that could be a lot of work so just being able to scan real life paper and put the papers in some kind of order in RBR folder that works aswell, maybe that is less work for you. We have made notes before so it’s no problem. Anyway loving your work! Get in touch if you need help, I’ve done alot of coding but never touched any modding. Good to hear you like it. A paper held by the codriver with the Vive controller would maybe be possible and not too hard to add, though I guess it would only make sense with the driver driving with the “flat” monitor. In the reverse setup (driver in VR and codriver looking at a monitor) the codriver can just hold a real paper. I’ll add it to my list of things to do but cannot promise I will ever have time to actually implement it. But meanwhile you may be able to do something like that yourself with a SteamVR overlay application outside of RBRvr (it would work in any SteamVR game then so maybe it would have other uses too). Thanks a lot for this great mod. It keeps RBR alive for many. I’d like to report a bug with the DK2. At some areas of the stages, the tracking bounces like in 1.4, working flawlesly the rest of the time. For instance, the first frech stage always starts for me with that unstable tracking. Besides this, I just can get 30fps, while in AC for example I get 60 without a problem. Any idea on how to improve this? i bought my rift mainly for assetto and rbr (i only got a gtx770 and i am below the official specs for the rift and must trick it to work with a sse bypass setup and installing old nv drivers but these games run fine on my spec) but rbr wont! is there any way you could make it work with the touch version of the rift ? i did much research and trying different things like runtime changing (to get extendet mode ) but “the runtime changer app guy” on youtube say that newest on wont work with older runtimes. adding non steam apps to the steam apps kist to be able start it in steamvr possible for rbr ? or using official home/steam mechanics ? Hey kegetys, first of all, thanks for your work on this plugin for RBR. Played this sim back when it was released, and I still fire it up from time to time when I need a dose of rallying. Now as you probably expected, here goes a cry for help ;-) I’m using an Oculus Rift CV1. The plugin works ok most of the time, but I’m getting a crash that prevents me from continuing into the Japan rally of the championship (second rally, after UK). Hopefully you can trace it back to the original code and with some luck it’s something easy to fix. I can also provide you with the full coredump. It’s around 1.6gb so let me know if you really need it, and I’ll upload it somewhere. That crash looks quite odd, it looks like the TestPlugin has created some dialog window. But the RBRTestPlugin is supposed to be just some example plugin that comes with the game, it should be safe to remove it. But it may be that the crash is actually caused by something different. hey mate, I need your help, if possible. just received my Oculus Rift. Set up oculus app, and then proceed to RBR since that’s mainly what I want these for. Need to install steamvr, so I did. calibrated as a standing device, and the floor measure set to 108cm – my line of view, when seated at my chair. The problem is, in game the view is quite low all the time, and the options to move up or down dont work. Mate, update on my question. I just found the solution, using OpenVRAdvanced settings. For now, seems like it needs to be changed everytime, but I’ll fid a better solution for sure! Now trying to move the gear speed indicator to a visible place, but everything is getting better now! Hi Kegetys, thanks for your work, it is awesome! D-pad support would be maybe possible to add, but meanwhile you could also use something like AntiMicro or joy2key to map joystick buttons to arrow keys. Of course, great tip! Tried Antimicro and it works, that is really convenient, tnhx! Do we have any re-caliblation key? It’s hard to do everytime with a vive wana. Is it just I dont know? key1 is only changing sight. Do you mean to re-center the seating position? Use the 0-key on the numpad to do that. Fantastic work you’ve done with the rbrVR! Love it! Tracks come alive just as in AC. 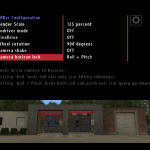 A complex question: I use RSRBR and the camhack plugin to render environment in preferred FOV. I’ve noticed there is a conflict when doing this and using rbrVR. I guess it is not even possible to use camhack together with rbrVR as it needs to be defined using other criterias such as scale? What are your thoughts about this? Is it possible via *.ini’s to set the FOV and aspect ratios so that rbrVR reads that before applying scale? Best wishes for 2018 and your small but very unique contributions to PC-simulations! Hello. Changing the FOV or aspect ratio in VR is in general a bad idea. Only thing it would do is make the image appear incorrect in the headset as the lens distortion would be wrong, and reprojection would be applied incorrect as well. Thanks again for this essential VR-tool for RBR! A stupid question, but how do I turn VR-mode off? Do I need to remove/replace the *.dll’s? Or is there an easy way to swap between VR and Normal (screen) mode?